Electric semi-truck startup Nikola Motor Co. is ratcheting up anticipation for its upcoming launch event by teasing the reveal of three products key to its vision of an emissions-free freight future. On Dec. 1 in Salt Lake City, the private company plans to show off its Nikola One electric truck as well as a model-agnostic battery pack and a hydrogen fueling station, it said Thursday. Industry watchers hope that the debut will shed more light on plans that, so far, have been substantial in scope but light on specifics. 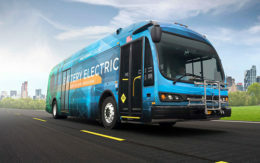 The company is competing with more established manufacturers such as Daimler, Tesla, Mack and BYD that are also planning to develop heavy-duty electric vehicles. The company has described the Nikola One big rig as the most fuel-efficient Class 8 truck ever built. North American models will purportedly be powered by a custom-made 800v hydrogen fuel cell, capable of traveling 800 to 1,200 miles between fill-ups while achieving 15 to 20 miles per gallon with a full load. The truck’s zero emissions pedigree would allow it to exceed all government greenhouse gas mandates in effect over the next decade, including the Environmental Protection Agency’s recently announced Phase 2 standards. Interest in the truck has been high. The company said it scored nearly $3 billion in reservations within 30 days of accepting requests. The vehicle, slated for road-readiness by 2019, has even been imagined as a replacement postal delivery truck. But skepticism is also pervasive. In August, Nikola made an abrupt about-face from earlier plans to operate the semi using natural gas-fueled turbines. Instead, the company said, the technology will be developed later abroad to sidestep difficult emissions testing domestically. Come Dec. 1, though, the company also plans to display an example of the hydrogen stations it hopes to scatter across the continent. Initially, 56 stations will go up around North America, with more than 300 planned stations eventually making up the largest hydrogen network in the world, Nikola said. Using hydrogen created on solar hydrogen farms built by Nikola as part of a vertically-integrated supply system, the stations will sell the fuel to non-Nikola customers for $3.50 a kilogram — nearly half the current market price, according to the company. Rounding out its suite of products set for Salt Lake City, Nikola also intends to exhibit its 107-kilowatt-hour lithium battery pack. The pack is designed for the company’s Nikola Zero electric utility task vehicle but will go on sale next year as an option for other vehicle models and as an upgrade option for Nikola Zero owners. I’m I the process of starting my own fleet and I’m very interested in operating a green company. I’d like to attend a presentation on the Nikola one. I’m in los Angeles California, please keep me posted.